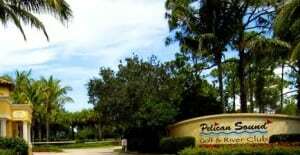 Pelican Sound is master-planned golfing community in Estero, Florida. The 27-hole championship course was designed by Chip Powell and Mike Hill. Golf membership is for residents only; Golf fees are bundled into the master association dues. There are a variety of home styles in Pelican Sound: single-family homes, coach homes and condos. Pelican Sound amenities include 6 lighted Har-Tru tennis courts, 6 swimming pools, gulf access via boat launch, boat storage area (up to 24 feet), free use of kayaks and canoes, boat shuttle to Lovers Key Beach, Club house with formal dining, River Club with casual dining, fitness center with planned fitness activities, planned social activities, and walking trails. A community water taxi provides transport to Lover’s Key State Park and its renowned beaches. Pelican Sound is conveniently located and is just minutes to up-scale shops and dining at Coconut Point Mall, Miromar Outlets and Gulf Coast Mall. 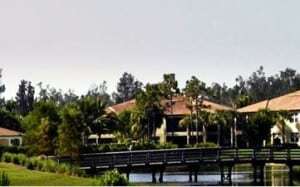 Pelican sound is 20 minutes to Southwest Florida International Airport (RSW).